Years ago, I watched a man walking through our neighborhood using what I then suspected were ski poles. He seemed to be moving at a fair pace, and with apparent ease. 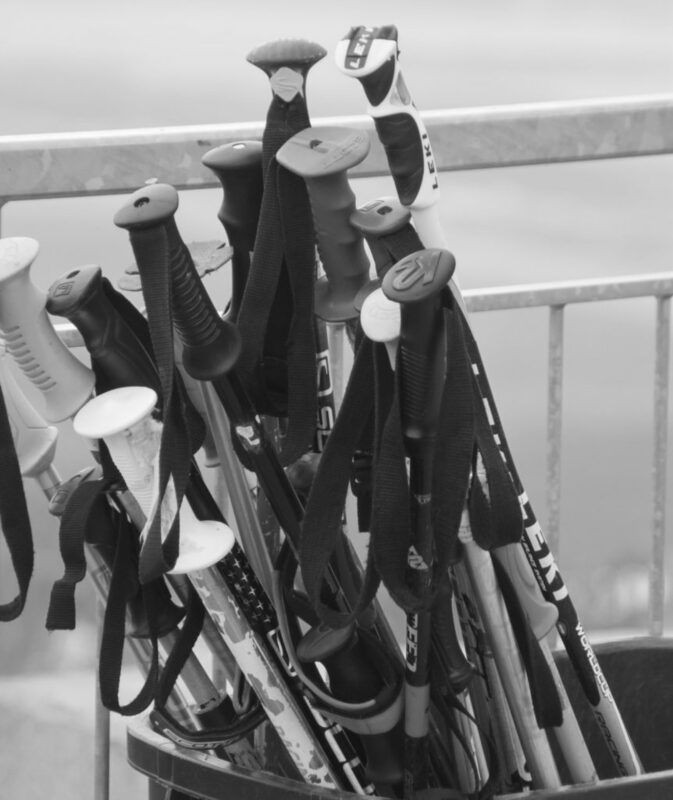 As he seemed to be perhaps in his sixties, he was to me – back then – incredibly old, and I assumed that either the ski poles were part of some vestigial ritual from an era long gone, or some remedy, anomaly or annoyance associated with the man’s crushing age. This cloudy experience came upon me when I was still single, living with my parents, and drearily attending junior high school – the most slim and sparse speck of my life, a thinly unicellular past of legend and myth, rumor and exaggeration. I possessed no definite understanding of, nor interest in, the event, so it dulled to nothing but an ember in an unspectacular fold of my then elastic memory, one half neuron from forgotten. Fifty years later, I developed an inflamed left Achilles tendon. I have no clue why or how. I would not have developed it if I could have avoided it. In partial remedy, I took to walking with a cane. At times, it helped. Later, because it was much more of a positive visual, I transitioned to a walking staff. I would clack through the botanical gardens or neighborhood or the walking trails of the large municipal park with my wife, looking like the experienced trekker – not the limping, over worn invalid. My staff had a hanging strap, and stickers of the footprints of typical woodland creatures. I could guess what some of those creatures might have been, or looked like. One day at the shoe store – looking for shoes that would help with my always testy Achilles – I noted to the shoe store owner that I walked with a hiking staff to displace pressure on my foot – and she asked if I had tried trekking poles. Yes. She asked if I had ever seen someone walking about with ski poles, and yet there be no snow, nor eminent threat of it. The ember of that long ago encounter with the desperately aged walker shuddered and stirred. It sputtered a little, stretched a little against the rigidity that had grown around it, breathed, and then eventually glowed. I suspected the truth of my recollection, as the memory was a pre-wife recollection, and thus raw and unedited, a bit given to serendipity and freedom. But I was able to draw it up, see the heft of the man’s gait, imagine his method. Not ski poles. Trekking poles. They change the way you walk, if you use them correctly. And now I was that old man. I have my own calcified rituals, my own anomalies. I studied the strange practice, watched a few Internet videos, read a review or two, and we were off to the wilderness store. We. If I were to partake of the community of trekking poles, so would the wife: I did not want to look stupid alone, and the wife did not want me to look innovative alone. We would be in this together. You have to learn the rhythm, master the gait: the forward reach, the draw through, the push off at the back of the movement. The tendency to look where you are placing your pole tips can rob you of sight invested in your surroundings: you must struggle against it. There is just so much wrist to use, so much movement of the cocked arm, the step though of each leg. But once we, as a couple, mastered the poles, we became the shiny new oddity of the day. People stop in their steps to watch us. Drivers sight us ahead and spin their heads away from the road as they pass, endangering all to try to figure out what we are up to. Passing walkers, as ignorant as once I was, make ski jokes. Snow jokes. Changing weather jokes. We trek on. Practiced quadrupeds. Clack, clack, clack. We move faster than we did with only I using the staff and the wife empowered by only two legs. Our poles have (at additional cost) rubber tips, as we walk mostly on pavement, but there is still often a strike and reply between the pole and the macadam. My left Achilles whines, sometimes yowls, now and again screams; but it is less troublesome when I use the poles than when I do not. Every so often when trekking amongst the crowds, upon innocently harvesting a group of on-lookers both sufficiently and selflessly engaged in watching us as we go – four points each – past: I will stop, feet together, deeply bent knees, torso pulled in over those knees until my back is parallel to the ground, then I will bring the shafts of both poles into the pits of my arm, face thrust forward as though to glide. Motionless, gliding, gliding nowhere, my wife clattering on ahead of me, my spectators wondering what is this man doing? What event is this? What is being done? And is he doing it well? After years of impersonating a Systems Engineer, Ken has retired to watch his wife of forty-one years continue to break both Masters and Open world raw powerlifting records. Ken’s two current poetry (“The Book of Robot” and “Victims of a Failed Civics”) and two short fiction collections (“Constant Animals” and “Avenging Cartography”) are available from Amazon and most book selling websites; www.barkingmoosepress.com; as well as Sundial Books.